WESTPORT — Harvey Weinstein may be keeping a low profile as he faces criminal charges of sexual assault in Manhattan, but his former Westport property hosted a lively star-studded wedding Saturday. 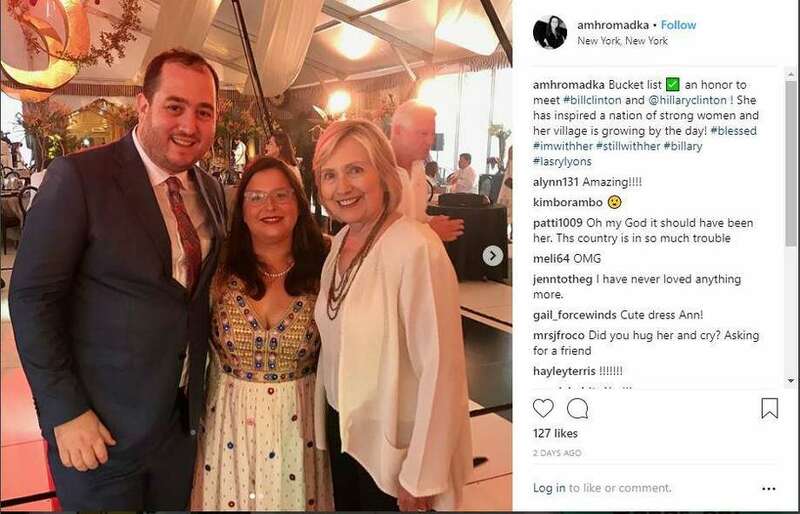 Bill and Hillary Clinton made the trip to Westport for the wedding of Democratic donor, NBA team owner and billionaire hedge fund CEO Marc Lasry’s son, Zach, and Arianna Lyons. The Lasrys own three properties on Westport’s ritzy Beachside Avenue, but glamorous camping — aka “glamping” — tents were set up on the former Weinstein property to provide after-hours sleeping quarters for wedding attendees. Instagram photos searchable under the hashtag #lasrylons suggest the wedding was an unique event. Guest were asked to wear all-white, and aerial dancers performed under a circus tent following the waterfront ceremony. “I truly have no words to properly describe the time I has this week celebrating Zach and Arianna’s Circus of Love,” wrote one Instagram user under a photo of the event. Westport’s town clerk confirmed a marriage license had been filed for the couple, but as of deadline had not been made official. The senior Lasry left his position as a board member of The Weinstein Company in October 2017, following revelations of sexual harassment allegations against Weinstein. Weinstein was reportedly not at the wedding, though he is still living in his former Westport home and has been seen around town at local markets and at movies in Norwalk. In February, Weinstein sold his adjacent Beachside Avenue properties for $16 million to fellow Beachside Avenue resident and property maven Andrew Bentley, who first bought property on the street in 2010 and in the years since has gobbled up three more properties on the pricey street. Though Bentley officially owns the property, Weinstein is allowed to stay in his former house for a few more months. Marc Lasry, 58, is the co-founder and chief executive officer of Avenue Capital Group and the co-owner of the NBA’s Milwaukee Bucks. Lasry is married to Cathy Cohen and they have five children. Their son, Alexander, worked for White House senior adviser Valerie Jarrett. Their daughter, Samantha, was a staffer for former U.S. Rep. Rahm Emanuel.